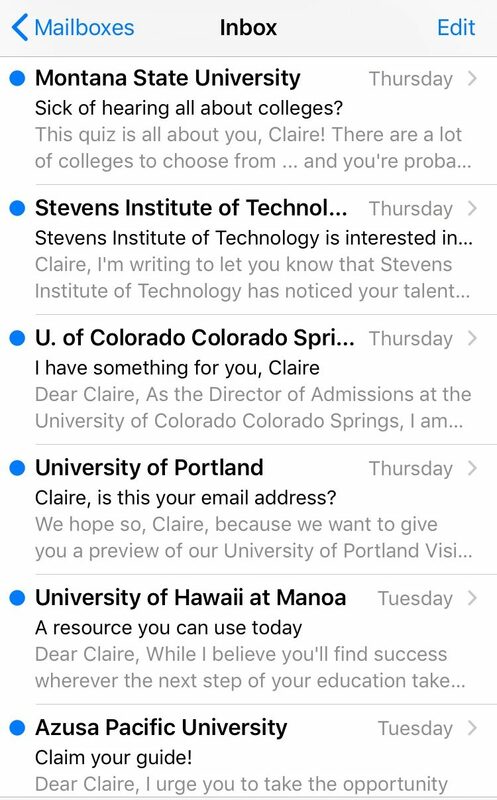 Every year following the PSAT exam, emails opening as such flood students’ inboxes shortly after the College Board disseminates their contact information to admission offices (individual information is typically sold for 50 respectively). Many consider these emails flattering, after all, one would be guaranteed acceptance to a college that contacts them on a weekly basis, right? A look at the true interests of college admission officers would indicate the opposite being true. In reality, colleges send out mass emails to high school sophomores and juniors due to a couple of reasons: they are making an effort to lower their acceptance rate, and/or profit off the money they receive from applications. These intents prove college recruitment efforts to be problematic and misleading, making it crucial that students understand the true basis of their outreach. Colleges contact students in an effort to heighten their prestige. In order to make that happen, they look to low acceptance rates. To achieve this, colleges send out thousands of emails flattering students, which in turn obligates them to apply. This ends in a majority of them going on to be rejected, which is reflected in the college’s acceptance rate. In her Washington Post article titled “Dear elite colleges, please stop recruiting students like me if you know we won’t get in,” high school senior Amanda Graves takes the example of Yale, an Ivy League with an acceptance rate of around seven percent. Every year, their admissions team contacts nearly 80,000 high school students for its class of around 1,300, meaning that a majority of their convinced applicants will, in fact, go on to be rejected. Colleges make students feel as if they will be granted admission they can only deny them with upon little consideration. The emails that were allegedly expressing interest in students wind up leaving applicants confused, acceptance rates lowered, and prestige fulfilled. Colleges seek to gain money from an increased number in applications. With the average application fee at $50, times thousands of applications, one can do the math and figure out just how much a college is profiting off of the number of students applying. In fact, most colleges obtain a significant portion of their money through application fees. Harvard, for example, makes over $3 million each year off of rejected applications alone, according to Business Insider. UCLA makes well over $5 million. Many of these applicants are most likely students that felt obligated to apply as a result of the college’s outreach. All things considered, students ought to reconsider college emails and what they truly mean in order to prevent them from applying to colleges they do not really have an interest in. On the other hand, colleges must stop showering students they know they will not accept with attention. To the forever unread college emails collecting dust in students’ inboxes, better luck next time. I’m so, so glad you wrote this story! Great job!